Takeaway: #NeverAgain has arrived amid rising public consensus about gun control and mounting troubles for the firearms industry. Eight weeks after the Parkland school shooting, the #NeverAgain movement that emerged in its wake shows no sign of fading. Impassioned students have become the face of gun control advocacy, with some calling them the “voice of a generation­” determined to take action. This portrait, however, isn’t really accurate: Polls show that young people as a whole are no more supportive of gun control measures than their elders. 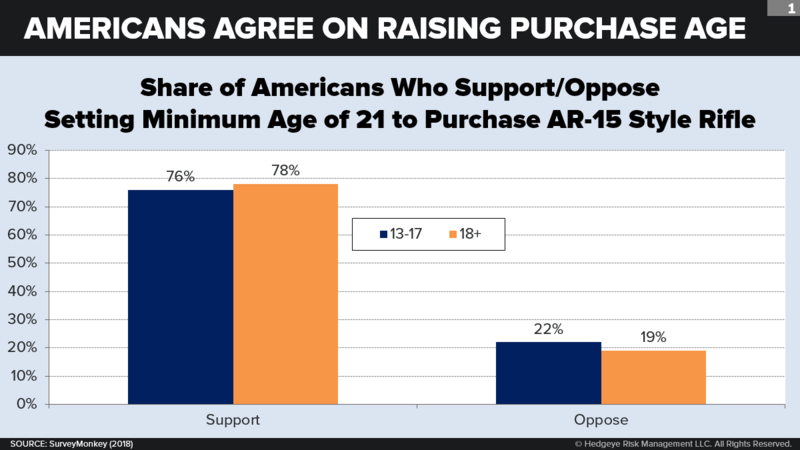 Those speaking out aren’t so much representing their generation as they are the American public, with overall support for stricter gun laws now hitting record highs. What is unique about #NeverAgain is its approach to activism, with Millennial and Homelander activists emphasizing practicality, safety, and civic-mindedness—a formula that has put them at odds with an increasingly strident NRA, but that might not do much to affect a firearms industry whose current slump has little to do with the national dialogue. This framing makes for a compelling story. But it’s not true. Young people don’t differ much from their parents and grandparents when it comes to gun control. Gallup data since 2015 indicate that on average, adults under 30 are only 1 percentage point more likely to support stricter gun laws than the national average of 57 percent. Most Americans strongly favor the policies #NeverAgain is promoting, such as universal background checks and the creation of a federal gun-sales database. Support for increased gun control typically ticks up after mass shootings, but notably, the post-Parkland figures from Quinnipiac University, Morning Consult, and NPR/Ipsos are at their highest levels ever (ranging from 66 to 75 percent). Teens didn’t dominate the March for Our Lives attendees, either: According to a survey by University of Maryland professor Dana R. Fisher, only about 10 percent of the crowd was under 18. In some ways, young people are actually less progressive about guns than their elders. According to the Pew Research Center and Gallup, adults under 30 are less likely to own a gun than older generations. Those who do, however, are more likely to participate in gun-related activities such as shooting clubs or online discussion forums. Furthermore, young adults are least likely to support banning assault-style weapons or high-capacity magazines, and most likely to support concealed carry. “What we're hearing now in the immediate aftermath of Parkland might not be representative of what a whole generation feels,” Kim Parker, Pew’s director of social trends research, told NPR. To be sure, these polls questioned young adults, not the teens who launched the movement. Support for gun control may be stronger among late-wave Millennials and early-wave Homelanders, who tend to be polled less due to parental consent requirements. A USA Today/Ipsos poll of 13- to-24-year-olds taken last month did find that fear of gun violence is more pronounced among those under 18: Fully 53 percent of 13- to 17-year-olds say it’s “a major worry,” compared to 32 percent of 18- to 24-year-olds. Teens are also more likely than the older group to support banning the mentally ill from owning firearms, installing metal detectors in schools, and (by a margin of 19 percentage points) banning semi-automatic weapons—even as they’re less confident that these measures would succeed in preventing mass shootings. Nowhere is this clearer than in its embrace by corporate America. 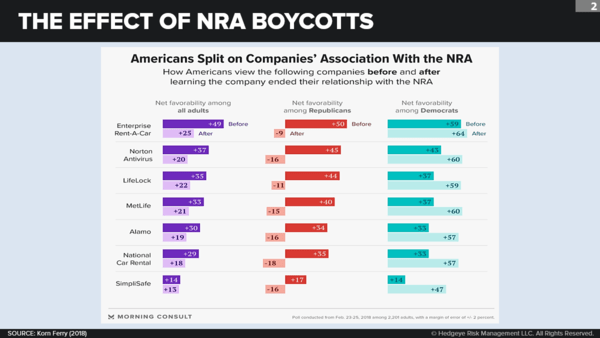 Dozens of big-name businesses, including Walmart, United, Wyndham, and Citigroup, have changed policies favorable to NRA members or increased gun-related restrictions. Meanwhile, nearly 150 professional investors are "strongly urging" companies involved with the firearms industry to take a stand. BlackRock, the world’s largest asset manager, is exploring ways to exclude gun makers from client portfolios. Stocks of major gun companies, including American Outdoor Brands, Vista Outdoor, and Ruger, have declined over the past month. Some of gun makers’ troubles can be tied to the public backlash. But the industry was already facing challenges even before Parkland. Firearms giant Remington announced in mid-February it was filing for bankruptcy. After the 2016 election, gun sales tumbled; when Republicans are in power, fewer people buy firearms out of fear of new regulations. January 2018 was the slowest month for purchases since 2012. The industry is also on edge thanks to a pending court case in Connecticut that could result in gun makers being held legally responsible for mass shootings. At the same time, it’s important to note that just 3 percent of Americans own over half the nation’s guns, making sales heavily dependent on relatively few enthusiasts. Though gun companies are struggling now, they’re unlikely to lose business from their core buyers over time. In any case, #NeverAgain isn’t targeting the firearms industry itself. It is a plea for action to those in power from a generation of youth who believe in their right to protection. 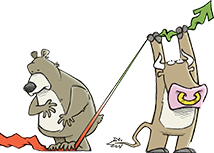 Their civil tone and pragmatist stance has resulted in more firebrand adults issuing apologies to them than the other way around. While the movement’s legislative victories have so far been modest, its vision of a better world—safe, sensible, and cooperative—is one that has resonated so widely precisely because it’s so easy to swallow. The #NeverAgain movement has reignited the national debate about gun control. Though high school students are leading the conversation, support for gun control actually cuts across generational lines. Most of the movement’s policy proposals have strong public support. Gun control will play a major, if not defining, role in the midterms. Democrats are seizing on the energy surrounding #NeverAgain, hosting registration drives for young voters and emphasizing gun control in close races from Colorado to Virginia. In a recent Quinnipiac University survey, 18- to 34-year-olds were most likely to say they feel “more motivated than usual” to vote this year. But while gun issues are undoubtedly on people’s minds, they might not be the key to a blue wave. According to Gallup, health care is the top concern of most Americans: With insurance rates expected to soar in October, both parties will likely be focusing on premiums rather than guns. The firearms industry thrives in a fear-based environment. According to researchers from Wellesley College, there isn’t a consistent link between mass shootings and surging gun sales. From 1998 through 2012, only a few events (Y2K, September 11, and the 2008 election) generated modest bumps in sales. By far the biggest spikes followed the Sandy Hook and San Bernardino shootings, amid calls for gun control from President Obama. No such spikes occurred after Las Vegas or Sutherland Springs; indeed, with little fear of new restrictions under Republican leadership, gun sales have cratered. This dynamic means that, ironically, the desire to prevent more mass shootings leads to more guns. Despite perceptions, school violence has long been on the decline. From 1992 to 2016, the number of students who were victims of crimes at school plunged 85 percent, according to the National Center for Education Statistics. University of Virginia professor Dewey Cornell told The Atlantic that students are far more likely to be injured in restaurants than in schools, which are generally “much safer than the communities around them.” The vast majority of mass shootings are linked to domestic violence­, target adults, and take place at home. As with other trends involving youth and violence, public tolerance is declining faster than actual behavior is changing.